Home > Over the Years > Over the Fiscal Years (2012 APR - 2016 MAR)　> Three Doctors from Brazil and a Nurse from U.S. Invited for Training. Three Doctors from Brazil and a Nurse from U.S. Invited for Training. 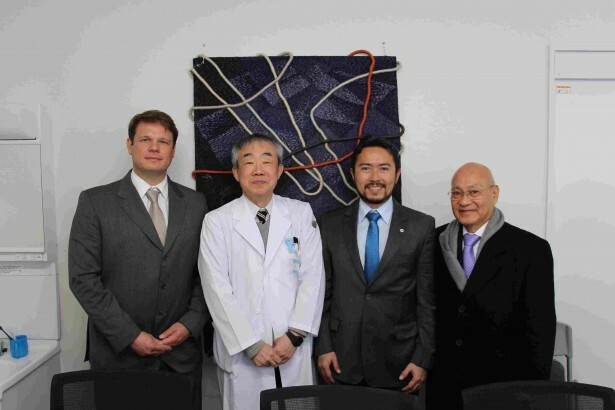 With Dr. Nagata (second from the left), Professor of Department of Radiation Oncology, Hiroshima University Hospital. 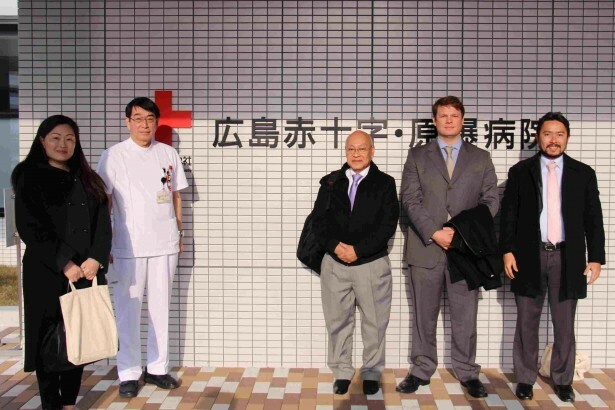 With Dr. Kaseda (second from the left), Vice President of Hiroshima Red Cross Hospital & Atomic-bomb Survivors Hospital. 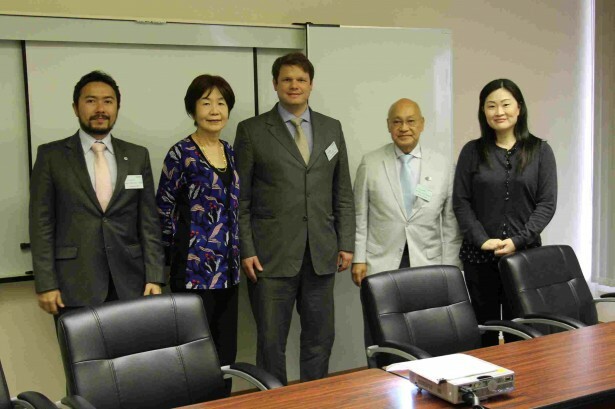 With Prof. Tashiro (center), Hiroshima University Research Institute for Radiation Biology and Medicine. 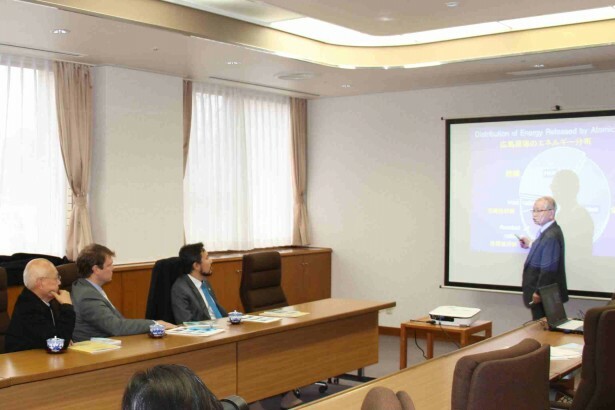 Dr. Kamada (right), Former Board Chairman of Hiroshima A-Bomb Survivors Relief Foundation, gave a lecture at nursing home, Kurakake Nozomi-en. 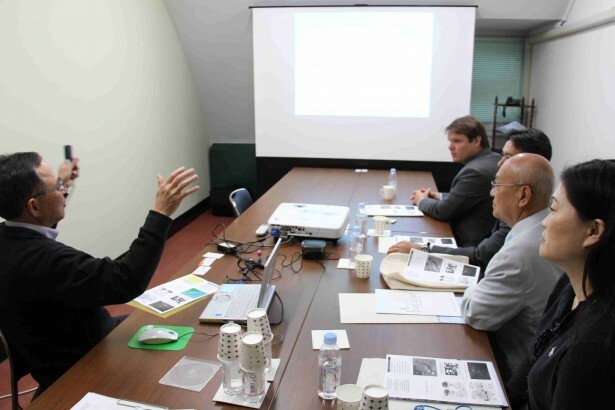 Dr. Hayashi (left), assistant department chief, Department of Molecular Biosciences, Radiation Effects Research Foundation gave a lecture. 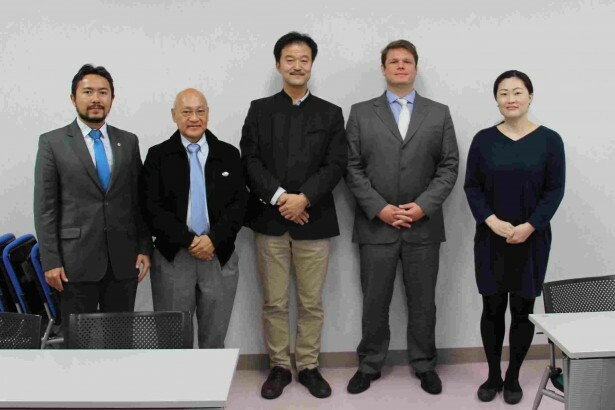 With Director Fujiwara (second from the left), Health Management & Promotion Center, Hiroshima Atomic Bomb Casualty Council. 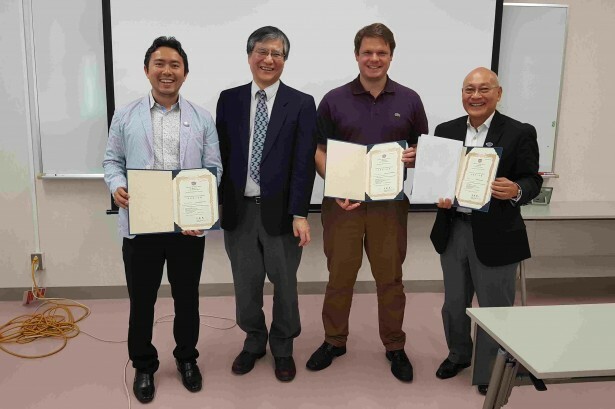 Prof. Inaba (second from the left), Hiroshima University Research Institute for Radiation Biology and Medicine gave certificates to the trainees. - I am very pleased and deeply thankful to come here and see and also feel what happened. And also to see the effort not only to recover but also in to become A BEACON that spread the message that what happened here must not never again. - I think that the training period is suitable, but the younger with more time could be benefited better by carrying out more intensive training with better advantage keeping valuable knowledge. If they have any medical concerns, I will encourage to discuss that with their primary care provider for further evaluation. - I’ll make sure the survivors who live in U.S. receive their financial and medical benefit. - Research on the effects of the explosion on the environment and people’s health, as well as knowledge and experience in the diagnosis and treatment of disorders caused by this radiation, should be multiplied to help and prepare other cities, states and countries in the care and follow-up of possible accidents related to radiation exposure. In this way, I intend to use the knowledge acquired in this course to train and prepare other doctors, students and health professionals to attend patients who are victims of their exposure.